Well, not much to report this week since the weather has been very hot and cloudy at night and Resident Astronomer Peggy has been under the influence of stomach flu or such. Besides I was still sort of bummed out about my last week attempt to capture an image of Andromeda Galaxy (M31). 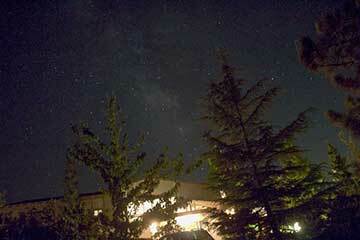 Recall that all I could get at Black Star canyon was the glow of the galaxy core with none of the spiral arms detail. What to do to rectify that? attending the CSULB physics colloquia on Light Nuclei and the Universe. What with two hours of driving, hour lecture, and hour lunch, I'm beat and ready for a nap. Professor Nollett, SDSU, made a great presentation on Big Bang nucleosynthesis. Our science squad of retirees had lunch with the group with more good discussion. Also, as usual, it was great to be back on campus and see the summer sights. The rest of this week will be spent at the Solar Power International 2015 conference at the Anaheim Convention Center. I'm attending this conference to review one of my old dreams of working or consulting in solar power. In my previous working life, I dreamed of building large utility scale solar plants for many years, but had essentially zero actual years experience in the field. I had put together a business plan for my employer at that time, but couldn't quite make the business case for us to enter that market. Yah, right, what kind of a consultant could I be with that measure of experience? Anyway, it should be fun checking out how the industry is progressing. Then, next week I'm flying to Portland to check out another old dream at the EESAT 2015 energy storage conference. If solar and wind power are going to continue making inroads into supplying more electricity then a more viable electric energy storage technology is needed. I had done many conceptual design studies for large energy storage concepts involving many different storage technologies. This field was another technology area that I hoped to be in and make an impact, but again my dreams weren't to be. I still should have fun hearing about the latest storage technologies and projects and I guess, finally put that dream to rest as well. So, maybe in a couple of weeks I can get back to getting a better image of M31. How to get a better image? This reminds me of an email I just got from another amateur, "telescope still packed away in the garage", Frank, who asked if maybe a larger telescope would be needed to get the kind of image I had in mind for M31? I think the answer to that question is more about signal to noise ratio rather than the telescope size. Some of the members of the OCA astro imagers SIG have taken great images of deep sky objects like M31 and have used small 3-5 inch scopes. The secret is to first of all start in a really dark sky site and then takes lots and lots of images over an observing period of several hours. These other more expert amateurs will take maybe 15 5-minute exposures, 5 each in filters for red, green and blue and stack them all together with computer processing. When I tried my little 5 inch scope last week the background sky light pretty much washed out any exposure lasting more than about a minute. Even with that high amount of light pollution if I had taken, say 100 30-second exposures, with good telescope tracking, I might have been able to stack all of this images together to get more detail of the spiral arms. But stacking all of those images is not really what I want to do yet. I probably would need to get a less noisy camera, which means a lot more money, also and that's not what I want to do yet. Oh, oh, I've been droning on and haven't even shown a photo yet, so how about if we finish up with this image from Astronomy Picture of the Day site from sometime back in the past. This image is a composite showing the relative size of M31, if it were bright enough to be seen in comparison to the size of the near full moon. See, M31 in all its detail covers about 8 times the arc distance that the moon displays. Images like this have really spoiled me and just being able to see a little smudge of light from M32 in the eyepiece or a little bigger blob of light in my camera time exposure just are not the same. Anyway, even if you've seen the image before, enjoy!